China Glaze In the Lime Light and Lynnderella Crocus Pocus were purchased by me. All opinions are my own honest thoughts. I hope all of my American readers had a fun and safe 4th of July! To be honest, I usually go away for a big dance competition around the 4th, so it felt weird to be home and I totally hated it. This is only the 2nd time in 16 years that I have missed this competition! 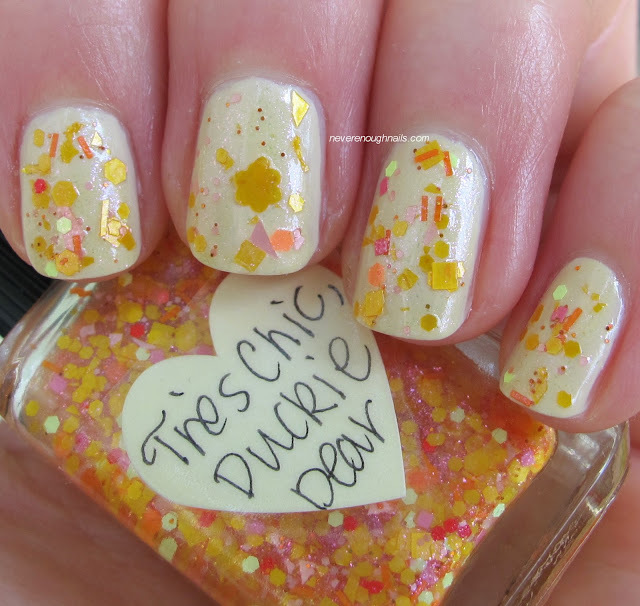 Anyway, today I have swatches of two polishes from Lynnderella's Everything's Coming Up Neon spring collection, Crocus Pocus and Tres Chic, Duckie Dear! Lynnderella Crocus Pocus is a unique and gorgeous mix of purple glitters. It's definitely a must for purple lovers. Lynnderella always has the best descriptions of her polishes, so she says this is "periwinkle, lavender, white, neon purple and blue iridescent flecks in a strong lavender-blue-shimmered base. Note the wizardry of Spring with assorted moons and stars." Love the fact that there are moons and stars in this!! I wanted to use a bright lime as a base because I love purple and lime together. It's such a summery combination! 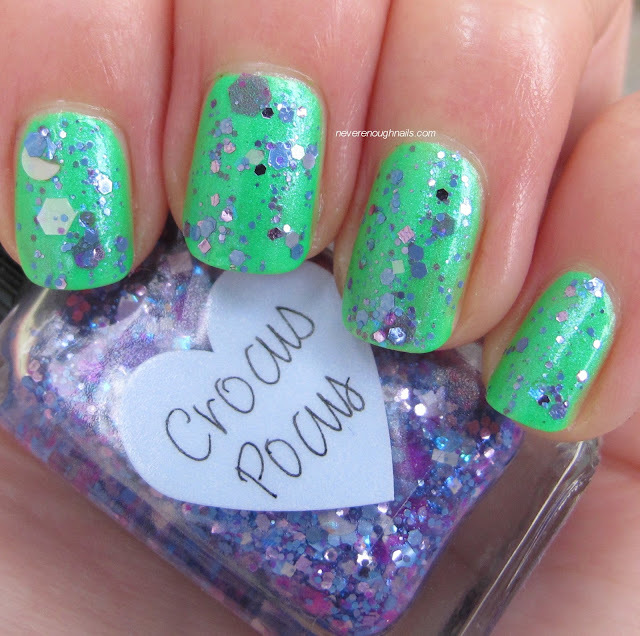 This is two coats of China Glaze In the Lime Light as a base and two coats of Crocus Pocus dabbed on top. Crocus Pocus is really easy to apply. It has a ton of glitter, so you don't have to struggle to get the glitter on your nail, but it's not thick either. I always dab my Lynnderellas on to make my application even easier. Zoya Jacqueline was sent for review. Lynnderella Tres Chic, Duckie Dear was purchased by me. All opinions are my own honest thoughts. 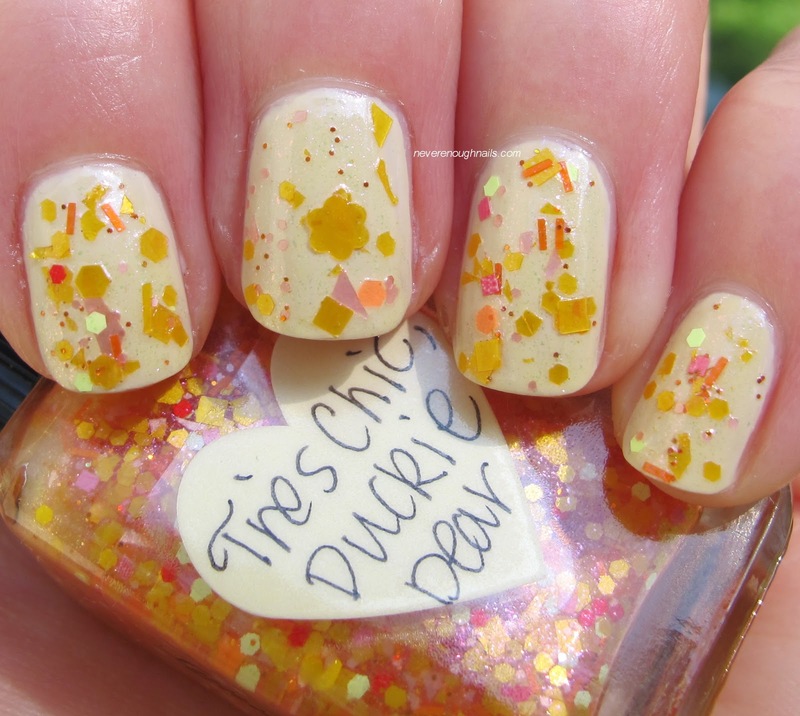 Lynnderella Tres Chic, Duckie Dear has such a great assortment of warm summery colors- yellow, orange and pink. I had been dying for a Lynnderella polish from the regular collection (not LE) with yellow glitter and she really answered my prayers with this one! It's amazing! It's hard to see in these pictures, but the base is filled with tons of stunning pink shimmer. I wanted a base color that would show off all of the different colors, so I chose Zoya Jacqueline, the perfect creamy off white. 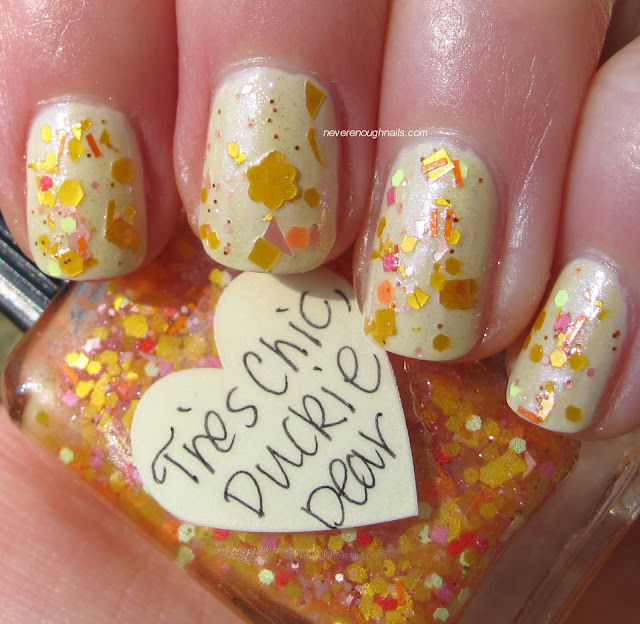 This is two coats of Jacqueline topped with two coats of Tres Chic, Duckie Dear. Duckie Dear applied pretty well with the dabbing method, but not quite as effortlessly as Crocus Pocus. That big yellow flower took a little bit of arranging too! 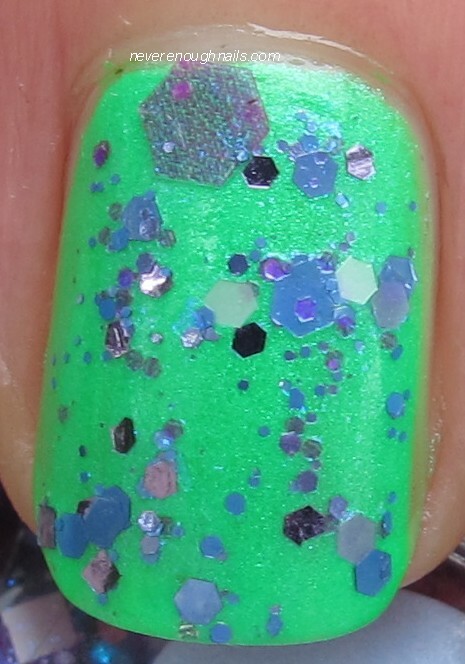 So far I have loved every polish I've tried from the Neon collection. I think it was one of Lynn's best collections yet. I have to wear Candy Blossom and Eggstra Pretty! and then I'll be ready to move on to my new Talismans and Birthstones polishes that just arrived! Lynnderella polishes are available on lynnderella.com. Zoya Jacqueline was sent for review. China Glaze In the Lime Light, Lynnderella Tres Chic, Duckie Dear, and Crocus Pocus were purchased by me. All opinions are my own honest thoughts.